We’re under a week from Selection Sunday. Only seven automatic bids are still up for grabs, and most will be really hard to pry away from the favorites. But what if both Washington & Jefferson and Case Western Reserve run the table? What if Widener upsets Delaware Valley? What if (insert your scenario here)? 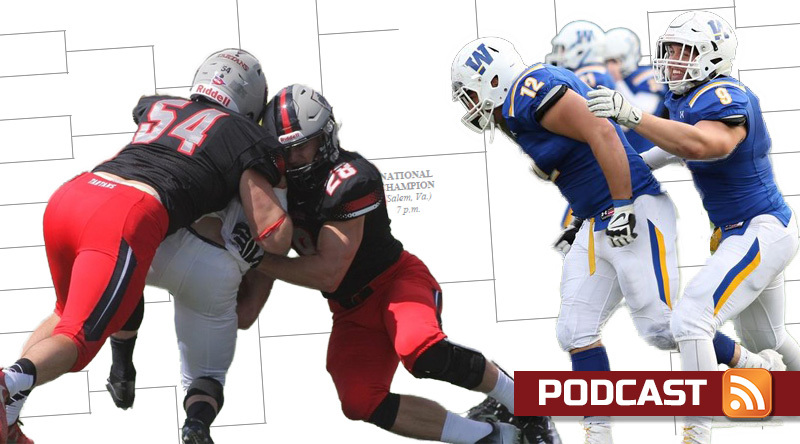 You can find out more in this week’s D3football.com Around the Nation podcast. This week, we thank Fanraise for sponsoring our podcast. Also, visit the new D3football.com store on Fanraise! Pat and Keith hand out game balls, find the hidden highlights, the interesting stats and much more in the D3football.com Around the Nation Podcast. This entry was posted in Around the Nation and tagged Adrian, Alfred, Alma, Amherst, Barry Streeter, Bethany, Bridgewater, Brockport, Case Western Reserve, Centre, Coast Guard, concordia-chicago, Cortland, Crown, Delaware Valley, DePauw, Eureka, Finlandia, Franklin & Marshall, Frostburg State, George Fox, Gettysburg, Grove City, Hampden-Sydney, Ithaca, Johns Hopkins, Keith's daughter's softball team, Lakeland, Linfield, Martin Luther, Merchant Marine, Monmouth, Montclair State, North Central, Northwestern (Minn.), Occidental, Ohio Northern, Olivet, Pacific Lutheran, Rowan, RPI, Salisbury, Shenandoah, St. Norbert, St. Thomas, Thomas More, Trine, Trinity (Conn.), Union, Utica, UW-La Crosse, UW-Platteville, UW-Whitewater, Wabash, Washington & Jefferson, Washington & Lee, Wesley, Westminster (Mo. ), Westminster (Pa.), Whittier, Widener, Wilmington, Wittenberg. Bookmark the permalink. Is it safe to assume that the winner of St. John’s and Concordia-Moorhead will receive an at large berth in the playoffs?